When the challenging year of learning and sharing their faith ended, he and another male teammate discerned a call to the priesthood, while a female teammate became a religious sister. Besides Bishop Cozzens, nine of the 89 Netters from that year entered priesthood or religious life — six priests and four women religious. It was an exceptional year, according to Mark Berchem, founder and executive director of National Evangelization Team (NET) Ministries, which trains teams of young adults to lead youth retreats around the country. “There was some real good camaraderie among the young men, in terms of talking about vocation,” he said. 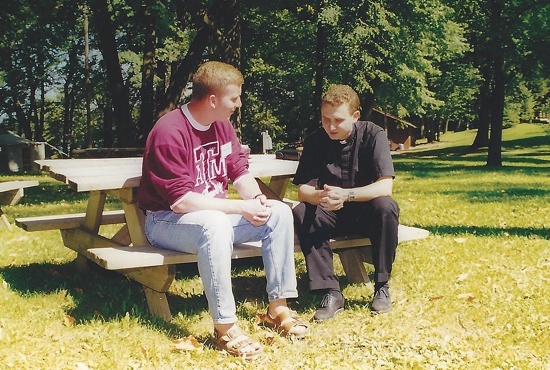 Father Chris Kuhn wasn’t thinking seriously about priesthood while on NET with Cozzens, but the future bishop was. Bishop Cozzens and co-leader Marcella Weisbruch made retreat and travel decisions for their team of 11. Patient with team members and retreat-attendees, the bishop seemed to understand quickly what his own supervisors expected, said Louis Hall, who co-supervised Bishop Cozzens’ NET team. Bishop Cozzens also led the men on his team pastorally, Berchem said. “You could see even in the early years that he really had a pastor’s heart in the way he cared for his guys — he rallied people really well,” he said. Especially helpful on the team’s travels to about 100 retreats was Bishop Cozzens’ strong sense of direction, Father Kuhn said. He would never get lost. Along with a good spatial sense of direction, Bishop Cozzens explained Church teaching while traveling to retreats and has offered sound spiritual direction to many, said Weisbruch, who lives in Temple, Texas. The bishop also has been good with young people and presents the Gospel without compromise while making it appealing, Berchem said. Since his own NET days, Bishop Cozzens has returned to lead talks and help with NET training, as well as preside annually at a Lifeline Mass. He positively influenced NET through his interest in strengthening the role of the sacraments and liturgy during staff training and debriefing, Hall said.